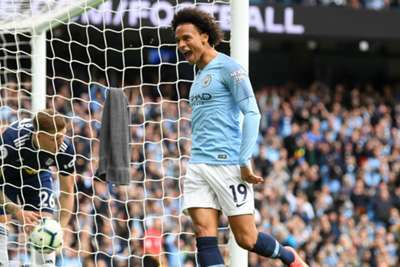 Manchester City manager Pep Guardiola confirmed the Premier League champions were working on a new deal for attacker Leroy Sane. Sane was the PFA Young Player of the Year last season, but made another slow start to this campaign. However, the Germany international has a goal and two assists in seven league games – three of those starts – this season, with City top of the table. Guardiola said City were eager to lock the 22-year-old into a new deal, with Sane's contract expiring in 2021. "The club are working on that, yes," the Spaniard said. "We value the quality of the player - the human being, the relationship with club, how settled he is, many things… that is what is important, not whether they have played well in one or two games. "Ups and downs, moments where you are better than other ones - that is normal. You help them in those moments. Help them understand how consistency is important for their careers and to become a better player then, after that, we will see. PEP: The club are working on that (a new contract for @LeroySane19). "Sometimes we need one type of game, sometimes another - quicker, more counter, more control, less control. "But there are no doubts about the quality of Leroy." City continue their campaign with a clash against Burnley on Saturday.